The name McAfee has been synonymous with antivirus and security since the late ‘80s and is considered as the granddaddy of the computer security world. 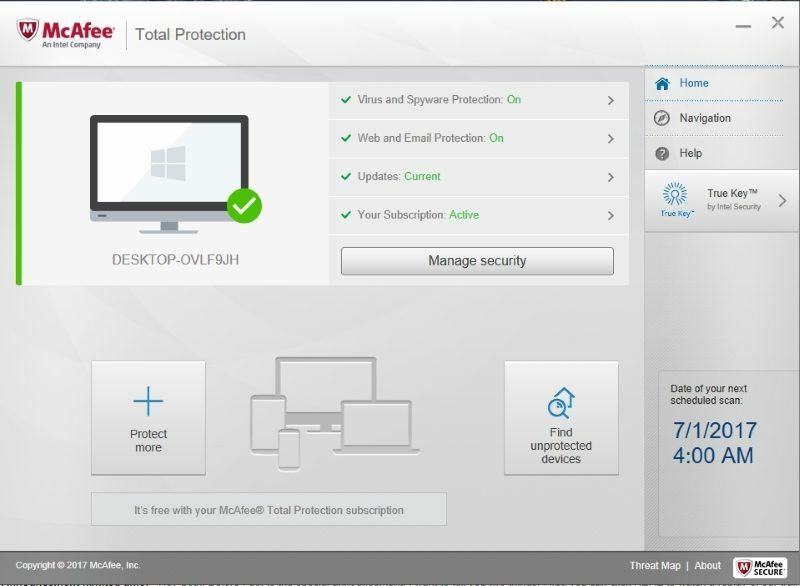 Its latest complete protection package, Total Protection, has a lot to offer the end user, as you’ll soon see. McAfee is now a part of Intel Security and as such it’s backed by the latest generation of hardware level security as well as it’s award winning software scanning engine. The name McAfee has seen some interesting press over the last decade, not just for the security software itself but also with regards to news reports on the company founder, John McAfee The founder’s colourful lifestyle aside, McAfee Total Protection is a singularly impressive suite of tools. The cost is a little higher than the previous entries, priced at £ for a one year subscription. 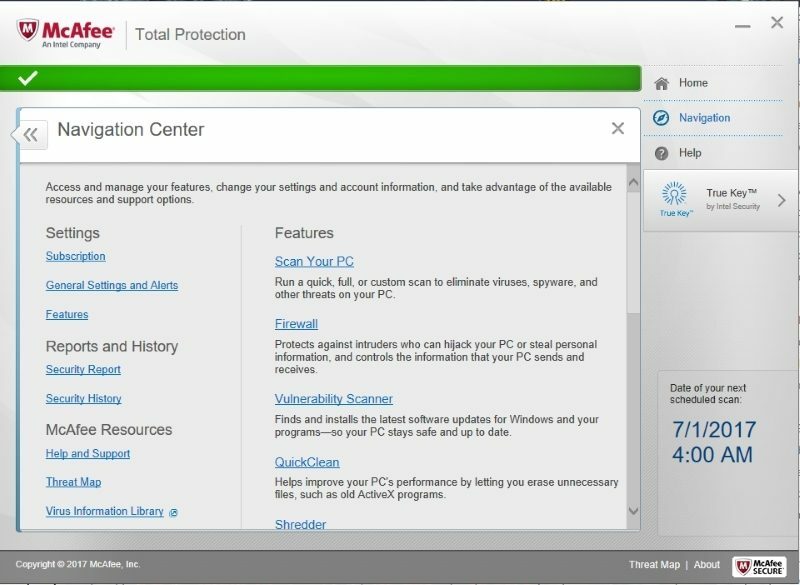 However, one highlighted feature is the Virus Protection Fledge, whereby you get your money back should McAfee not be able to remove a virus that’s already on your computer. It’s worth mentioning that the annual subscription includes installation on an unlimited number of devices; which is certainty worth, considering if you’re one of the many modern households that owns countless Internet-connected devices, computers and everything in between. It’s an excellent choice for the home user, without doubt. Installation and the initial full system scan were slower than that of Bitdefender and Kaspersky but only by about five minutes. If you’re constantly in a rush you may want to consider the other suites; however, most users will be satisfied with the result from. McAfee. At least it gives you time to make a cup of tea whilst you’re waiting for the scan to finish. Just as with the other products we’ve looked at, the interface is simple to understand and navigate, with the core, and most used, functions within easy reach of the mouse pointer, the more advanced options are neatly tucked away for those who are a little more knowledgeable about such things. In short, it works well and keeps the wealth of available options at bay until the user requests them. Needless to say the settings are extensive, allowing the advanced user a higher degree of control over the way the suite of tools works within the system it’s installed on. McAfee’s three tier approach to system protection is worthy of mention too. First, the scanning technology does a thorough, fine toothed comb inspection of the files on the system. Heuristic analysis then takes over, monitoring behaviour of files, functions and even code inspection to check for possible unknown viruses based on the way they work. Lastly, anything that’s even remotely suspicious is automatically uploaded to the McAfee Global Threat intelligence Lab for analysis. Should the code prove to be a new form of virus, then the team behind the impressive sounding lab will create a fix and push it out to the other two hundred million plus McAfee users. It’s not nice getting a computer virus but at least with McAfee you can bo assured that your misfortune is helping others. The Password Management feature is an interesting addition to the McAfee suite of tools. In reality it’s Intel’s True Key Security component, which although not perhaps top of the league of password management programs, does boast a multi-factor authentication process. In addition, you can set individual True Key passwords for all members of your family up to five users. Among the multitude of features you can find, FileLock an interesting addition. This is an impressive encryption mechanism that locks your files behind an impenetrable, military grade encryption wall. It’s not activated by default, which is understandable as encryption does still carry with it a higher level of user knowledge, and it’s not something the average user will immediately consider adopting when setting up then computer security. Performance wise, we’ve already mentioned that McAfee is somewhat slower than that of Bitdefender or Kaspersky but as with the other entries you won’t notice any perceivable slowdown in the computer’s operation with it installed. McAfee Total Protection does an excellent job of keeping your files and personal information safe when online and with its added features it’s certainly worth looking at in greater depth.